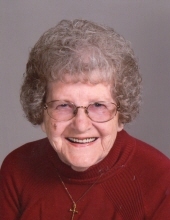 Mary Belle Bergmeier, 92, of Nauvoo, Illinois, passed away Saturday, March 30, 2019 at her son, Randy’s, home near Niota, Illinois. She was born on February 12, 1927 in Bentonsport, Iowa the daughter of Calvin and Jennie June Henry Corns. She married Tom Bergmeier. They later divorced. Mary was a 1945 graduate of the Fort Madison High School. Mary worked for John A. Kraus Company in Nauvoo for 52 years. She was an avid L.A. Dodgers and Kyle Busch fan. Mary enjoyed going on “critter drives” to look at wildlife. Her grandson and great-grandson were the light of her life. She was a member of the Sts. Peter & Paul Catholic Church in Nauvoo, where she was active in the Catholic Women’s Club. Survivors include, one son, Randy (Cathy) Bergmeier of Niota, one grandson, Jason (Autumn) Bergmeier, one great-grandson, Drake Bergmeier, two brothers, Wesley Corns of Fort Madison and Charles Corns of Burlington and several nieces and nephews. She was preceded in death by her parents, two sisters, Shirley and Barbara and one brother, Henry. A Mass of Christian Burial will be held at 10:00 a.m. Wednesday, April 3, 2019 at the Sts. Peter & Paul Catholic Church in Nauvoo with Fr. Tony Trosley as celebrant. Burial will be in the Sts. Peter & Paul Catholic Cemetery, Nauvoo. Friends may call after 1:00 p.m. Tuesday, April 2, at Schmitz-Banks & Beals Funeral Home in Nauvoo where the family will receive friends from 5:00 until 7:00 p.m. with a Parish Rosary recited at 6:30 p.m. A memorial fund has been established for the Sts. Peter & Paul Catholic Church or School. Please visit Mary’s obituary at sbbfuneralhome.com to leave a condolence. To plant a tree in memory of Mary B Bergmeier, please visit our Tribute Store. A Parish Rosary will be recited at 6:30 p.m.
"Email Address" would like to share the life celebration of Mary B Bergmeier. Click on the "link" to go to share a favorite memory or leave a condolence message for the family.